Harper Chalice have successfully launched their new TriSecure Perimeter Detection system into the high security market. As a leading supplier of other tested and approved perimeter solutions Harper Chalice have used their market knowledge and customer feedback to design a unique solution. TriSecure is a combination system that utilises both the CPNI-approved microphonic detection system, FenceSecure and CPNI-approved electric pulse fence system PulseSecure to create a single hybrid combining the best of both. 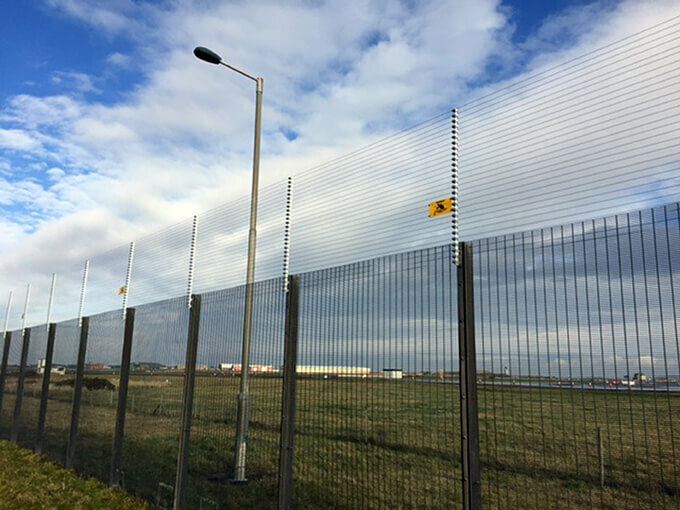 The issue relating to the electric fence system such as accidental shocks to staff or contractors and vegetation causing false alarms are removed as the electric fence is above the height of the host fence at more than 2m above ground level. At that height, all these issues are negated but the physical and psychological deterrent remains. Furthermore, as the electric fence provides the anti-climb prevention and detection, the Microphonic PID is only required to detect penetration attack meaning the system can be set up to reduce false alarms. Climbing attacks are always going to require a more sensitive setting to detect over a penetration attack. This negates the biggest perceived issue with microphonic PIDs, the false alarm ate. Both technologies are then brought together with Harper Chalice’s SecureBus communications network for centralised control and monitoring. SecureBus brings the two technologies together and presents the systems to the user as a single solution. SecureBus also provides TCP/IP connection and full system integration with other 3rd party security management systems to provide total control and monitoring. The TriSecure system has already been adopted as the chosen solution for many high security applications that would have previously had to choose between the two technologies.